Ham & Cheese ain't just a sandwich anymore. 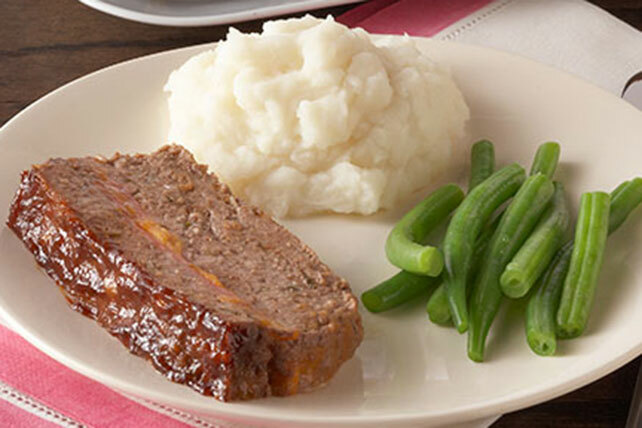 Try this Ham and Cheese Meatloaf. It's bursting with smoked ham and cheddar cheese for an extra hearty appeal. Place first 5 ingredients in large bowl. Add half each of the cheese and barbecue sauce; mix well. Press half onto bottom of 9x5-inch loaf pan. Cover with half the ham, remaining cheese and remaining ham; top with remaining ground beef mixture. Shape into loaf. Bake 1 hour 5 min. or until done (160ºF), brushing with remaining barbecue sauce after 50 min. Let stand 5 min. before slicing. Serve with hot mashed potatoes and steamed vegetables. Use an instant-read thermometer, inserted into center of finished loaf, for accurate testing of the meatloaf doneness.